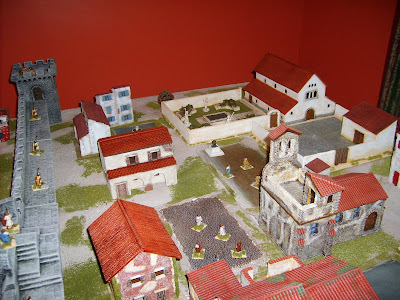 A little bit of history on one of the clubs that preceded the Furness Wargamers. This gaming club existed for a few years in the late 80s and early 90s and had quite a migratory existence. It started off as a semi-breakaway from the Penisular Wargames Society, apparently due to the number of junior players spoiling things there. There was a large number of sixth formers involved in this group at the start and this was my entry point to the club having never been to the Peninsulars despite having friends that did. Of course the number of students eventually dwindled as we went on to university etc. but the club maintained a reasonable number of members into the 90s. Initially based upstairs at the Red Cross Shop in Duke Street it lasted here for about a year. I had the unofficial role of doorman, having to run down the stairs whenever the doorbell rang to open the backdoor. Two reasonable sized rooms and a storage area on the 2nd floor, this was possibly the best place the club was ever at. At this time the games played was almost an equal split of Wargames, Boardgames and RPGs, with everyone doing a bit of everything. It then moved quite a distance to the then recently renovated Holbeck Community Centre near Crofters, but local residents complained about the noise (I'm not joking! The buildings is now shut permanently, Holbeck Community being an oxymoron.) Then back to town and Storey Square, home of the Amateur Operatics, and rat infested. The club initially starting off in the main hall but then eventually being relegated into the basement. Probably the strangest incident to happen there was when we entered the building one day to find the place decked out with swastikas. Fortunately it was just the singers preparing the scenery for a production of Cabaret and nothing more sinister! And this is where the club stayed, heading more and more to the boardgame\cardgame side of things and dwindling in members till it folded. I had gone to live down in Bolton while doing a postgrad course, and by the time I returned the club was no more. That effectivly ended my involvement with 'club' gaming for a number of years. 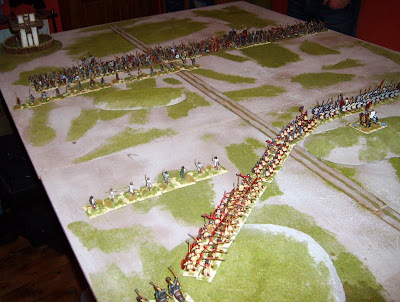 The final legacy of the Warlords was the chipboard 'tabletops', that the Furness Wargamers managed to somehow inherit, but which were left behind at the Railway Club when we moved to the Baptists. Condottiere: The original version with the long cards, and not the Fantasy Flight 'tweaked' version. A first run through for all of us. An enjoyably game which is easy to get your head around once you learn what the different type of cards do. Downfall of Pompeii: Another one straight out of the wrapper. No Frankie Howerd piece in this not too historical game of human sacrifice and molten lava. Rules took a bit of examining, but it played remarkably quickly once people got into the (lava) flow of things. 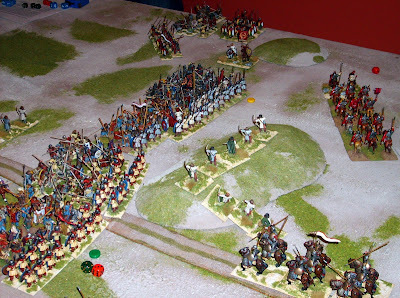 An ancients game at Matt's using the Fields of Glory rules. Set in the Eastern Roman Empire prior to the battle of Adrianopole in the Gothic War. Fritigern's Goths vs the Roman governors, Lupicinus and Maximus, with the Barbarians having the overwhelming weight of numbers. 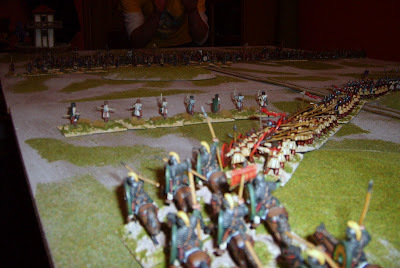 The armies were not points based so no idea who had the advantage if any. The Romans certainly weren't first rate troops. Very few units were good enough to qualify for re-rolls. The town to be defended. A haven of peace and slaves in the Danube region. The initial deployment. 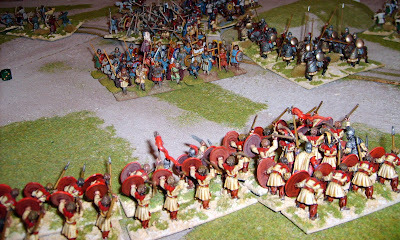 The Romans refused the left as that is where their weakest units were deployed. The idea being that the weak point is closest to where the reinforcements were due to appear. The Romans push their right forward. Since this was their best units they needed to make contact with the enemy A.S.A.P. The Goths themselves were only tentativly moving forward (Trying to reach optimum charge range). 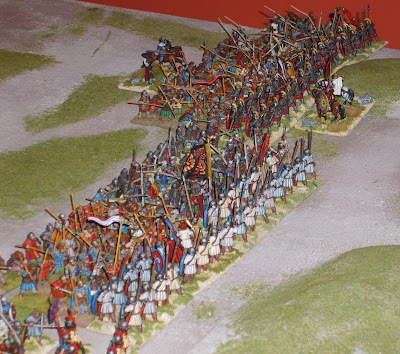 The Roman skirmishers had already withdrawn on the left. 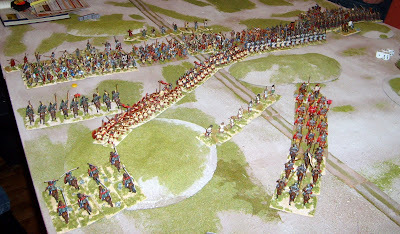 Both Leaders join in the front rank of the fight to try and break the stalemate. Leadership death rolls come close but no fatalities. The Goths left flank finally breaks and the pursuit catches them. Fritigern is removed as his unit eventually get wiped out. 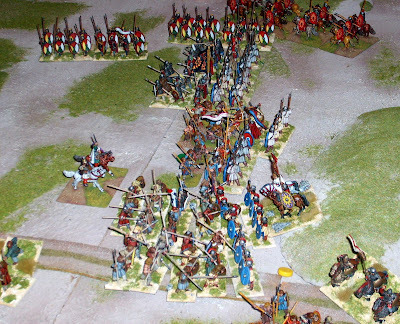 Due to a number of snake-eyes the Goth Right also collapsed due to a rather weak cavalry charge. The Cavalry continues to pursue the broken Goths to make room for a flanking maneuver from the new units pushing up. Both Goth flanks are now gone. The Goth centre manages to punch a hole through but the cavalry arrives just in time. Finally what remains of the centre comes under extreme pressure. And rather than carry on the massacre the game ends. Had boardgames session on Saturday, to commiserate Ray on his forthcoming birthday, and we managed to get a surprising number of games completed. Formula De: A quick two lap race around the Imola track, two cars each for six in total. A fast but high wear circuit if your unlucky. No crashes but a totally trashed car managed to cross the line. The new version of this is now out under the title Formula D, but not sure about it as it includes gimmicky street racing with characters, unlike the pure racing game which has a simplicity of play. Also I'm not sure that that the previous race track expansions are going to be re-released. Metro: A Eurogame nominally about building underground railways, but really a longest pipes win game. Actually nicely aggressive for a Euro. Managed a couple of games of this. Cityscape: Wooden block placement game where you have to guess the final 'skyline' to earn points. Closest game of the evening ending in a two way draw with third close behind. eRepublik is now official out of Beta and at v1. This also means that the war module that had been tested as then disabled is now back online and the two big power blocks in the game (ATLANTIS and PEACE) can get back to fisticuffs. Following historic tradition this involves invading France. The way war works is, in my opinion and that of a few others, deeply flawed, and favours uber-Rambos, burning gold (and therefore real-life money) to heal up and purchase all important weapons. 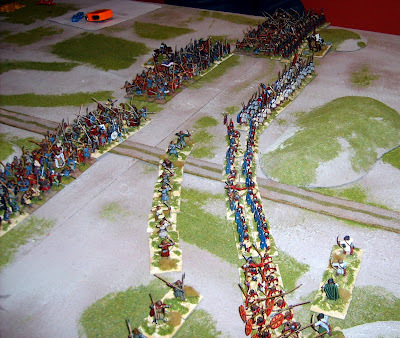 Given that Gold can be transferred between players this leads to one man armies. The number of fights you can participate in is governed by your Wellness and with each fight knocking some off. But with gold purchased wellness packs you can heal more and so fight more fights, getting more experience, and level up and fight better. Add to this that there are 'bugs' still in the system, and some people have accused the admins of favouritism to the French in this regards, as these bugs, such as not having hospitals enabled, only seem to affect the British. I think its actually just bad luck, but some sort of acknowledgement and refund to people who have used gold\money on a lost cause would of been good. I'm also not too happy with Britain's military structure as it seems detached from the countries actual military history. The Royal Navy has been set up for newbies in the Reserves and uses Army ranks. The other section of the Reserves is the Royal Guards (the only Royal Guardsmen I know of had a minor hit in the 60s with 'Snoopy vs the Red Baron'), Lieutenants out rank Majors, and organisation in general seems pretty limp. This isn't the fault of the game or its designers, but of the eUKs government who have set up the 'armed forces' as a meta-structure on top of the game. Also, as the war continues, Jingo-ism is starting to creep in with bad taste insults flying in from elements on both side. It's sort of a strange situation in that I want things to be more real but not that close to real life that the nasty stuff gets carried over. So NationStates2 has finally entered public beta, and I've finally been able to create and log in to my reserved nation (but only after a bit of hassle with the game crashing repeatedly under the setup procedure) and have been actively playing for a couple of weeks now. v2 just does not seem to be a natural progression from the original. It's almost as if someone had seen the original game and decided to do a slightly different version of it. Given that it is done by a different set of developers this is probably the case. Its now more of a Sim than a political parody, with resources and trade between Nations, and the rankings lists, one of my favourite parts of the original, seems to of been downgraded and also has become more serious, with things such as GDP and Birth rates being ranked rather than the old 'Furniture Restoration' style rankings that exists in v1. Also to get full features requires 'donations' to purchase 'Jennifers' that you use to enable features. Obviously the onscreen Google ads (that advertise rival games!) does not earn the company enough; whereas the original can cope with a few banner ads. NationStates2 has lost the fun factor that NationStates had. If they had expanded on that rather than add the Sim elements then it would be a better game. My last hope for it is that the Nations from the original alliance on v1 can get organised enough to reconstitute it on one of the worlds of v2. Unlike v1 the nations are split over different worlds and, apart from a one off transfer, the only way to travel between them is to burn some money! Unfortunately NS2 is hitting the numbers on v1 as members of the alliance has nearly halved in the last few months. So someone out there must like v2. I just hope they don't pull the plug on v1 too soon. A new version of an old classic, Junta was wheeled out on Tuesday as Alan L had turned up, being a gamer from a long time ago, when the Furness Warlords played out of the (now defunct) Red Cross Shop in Duke Street at the end of the 1980's. The original version being on of the most played games there. This is a new edition of the game and they seemed to of changed a few of the names of the cards\locations and the rules are no more clearer now than the original version. Only one coup occurred during the game and that was a success for the rebels. So only the two presidents throughout. The coup started in the traditional manner with the 'ceremonial bombardment of the Presidential Palace' by the Gunboat. This was in support of the students and radicals who had appeared in the streets and who managed to give the police a bashing when they decided to respond. The coup ended with the Rebels in direct control of three of the five areas. We decided not to shoot the (former) president but went for Alan and his stash of money - his decision to sit on the fence during the coup backfiring.